Cement silo of concrete batching plant is used for storage of bulk materials, however, concrete mixing plant is the equipment for producing concrete. People may think cement silo has nothing to do with concrete mixing plant, however bulk cement silo and concrete mixing plant have great relevance, that is the bulk cement silo is one of the main equipments of concrete mixing plant. The application of cement silo is not only in concrete mixing plant, it may be also used in cement manufacturing plant. The concrete mixing plant for storing cement usually employs cement silo for cement silo, bin is currently the most suitable for concrete mixing station as the storage device, it has a good moisture-proof feature. Generally, small concrete mixing plant will equipped with cement silo of 50 tons or 60 tons. It is according to your specific construction, and there are cement silos ranging for 80 tons to 200 . 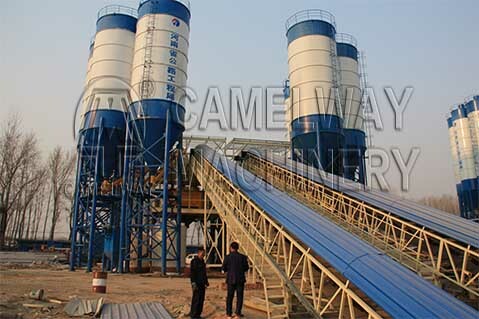 Zhengzhou CamelWay Machinery manufacturer also produces different storage equipment (water cement ash aggregates container)tower cranes, construction elevators, concrete mixing stations, JS concrete mixers, concrete batching machines, stabilized soil mixing stations, wheel loaders, concrete transport tanks, JZC concrete mixers and other construction machinery.